This paper addresses the marketability and sustainability of food security programmes in Limpopo Province. Food security features prominently because poverty and inequality remains a huge challenge in South Africa's rural sector. Thus the Government has initiated the establishment of agricultural community projects as part of interventions for creating jobs and improving income levels. However, lack of monitoring mechanisms in established projects create a challenge of non-sustainability of these projects. The study has used formative evaluation approach to determine the effectiveness of the established food security programme. A mixed model approach was used to collect data from key informants and project members. Descriptive statistics were computed using SPSS. Most projects were on vegetable, poultry and piggery production. The study has found that 64.1% of the respondents reported that access to inputs was not a challenge. 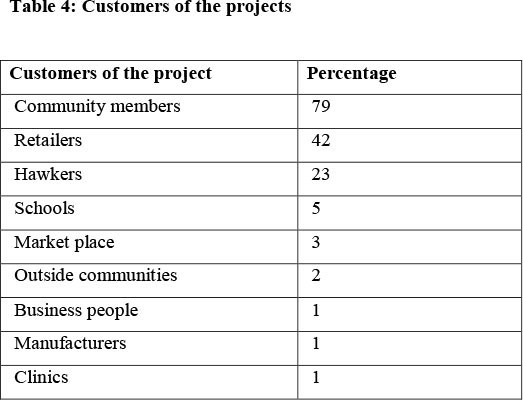 Project products are sold to community members who accounted to 79%, and few (1%) to individuals owning business, clinics and outside the community. 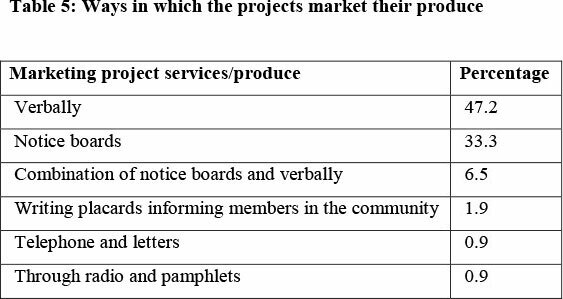 Project members advertised their produce mainly verbally (47.2%). Marketing strategies for project products were lacking and this creates a negative impact on income generated and sustainability of projects. The paper concludes by suggesting that project members should be advised on appropriate marketing strategies. Key words: community projects, inequality, marketing, poverty, products. The debate about food production and distribution will not go away in so far as food insecurity continues to plague the global population. Food security has deteriorated since 1995 and reductions in child malnutrition are proceeding slowly to meet the Millennium Development Goal (MDG) target of halving hunger by 2015 (Tirado, Cohen, Aberman, Meerman and Thompson, 2010: 1729). Many countries, especially in sub-Saharan Africa, are trying various food security programmes to assuage the situation. In South Africa, several food security programmes have been tried in the past (post 1994). However, lack of coordination as a result of the implementation of many food security programmes by different Government departments in all spheres led to the inability of the Departments to achieve the major objective of ensuring household food security and poverty reduction. For instance, The Integrated Food Security Strategy for South Africa (IFSS, 2002: 5). The challenges confronting the country in ensuring food security and poverty reduction could be attested to the quick revisions of food security policy initiative (IFSS 2002: 5). This paper is, therefore, based on the Programme to Support Pro-Poor Policy Development (PSPPD) facilitated in the Limpopo Province of South Africa by the Centre for Rural Development and Poverty Alleviation (CRDPA) of University of Venda (UNIVEN) and the Limpopo Department of Agriculture. The PSPPD evaluated government assisted food security and poverty alleviation projects in the provinvce. Factors that contributed to the success and failures of the projects were examined and appropriate recommendations for policy makers in addressing poverty alleviation initiatives were made. The overall objective of this paper was to explore two basic challenges arising out of the findings of the programme; marketability and sustainability of the agricultural sub-projects of food security projects implemented in the Province. Indeed, within South Africa and the entire Southern African Development Community (SADC) numerous explanations have been provided for the poor performance of the agricultural sector. Nonetheless, factors considered to have contributed most to the low growth rates include insufficient investment in agriculture, inadequate development of markets for agricultural commodities, credit and inputs (especially fertilizers and improved seed) and low levels of technology development and dissemination (Chilonda, Machethe and Minde, 2007: ix). However, the issues of marketability and sustainability have not been adequately assessed for community-based agricultural projects which have been set up to achieve food security and poverty reduction, priority areas of the Government (Nel, 2001: 1006; Nel, Binns and Bek, 2009: 224). Therefore, this paper specifically seeks to contribute to the vexed issues of marketability and sustainability of the community-based agricultural projects which are inextricably linked to their products and productivity but have been inadequately assessed for their policy implications. The rest of the paper has been organised into the following: The Conceptual framework is presented as section two; the Methodology is presented in section three; Results and Discussion are presented in section four and five, respectively. Section six presents the Conclusion and Policy Implications. The most common definition of "food security" is "access by all people at all times to enough and appropriate quality food to provide the energy and nutrients needed to maintain an active and healthy life" (Barrett, 2002: 4). According to Barrett (2002: 4), if food security involves access at all times to enough and appropriate foods, then "food insecurity" reflects uncertain access to enough and appropriate quality foods. Following the above, food security programmes may simply be referred to as projects and activities that are meant to empower beneficiaries to have adequate access to quality and nutritious food all the time. In the South African context, food security and its interventions can be traced to the IFSS of 2000 and its subsequent revisions by the government (IFSS, 2002: 6). In this policy document, food security is defined as physical, social and economic access to sufficient, safe and nutritious food by all South Africans at all times to meet their dietary and food preferences for an active and healthy life (IFSS, 2002: 6). In addition, a project is an individual or collaborative endeavour that frequently involves careful planning and designing in order to achieve a particular aim; that is to create a unique product, service or result in a specified time period. Therefore, it is it is a sequence of complex activities for achieving specific goal in a specified time period and within budget. Thus, a project has phases or cycles and is usually temporary rather than permanent (PMBOK Guide; Ward, 2000). This entails that a project has a beginning and an ending in specified time framework. Closed linked to a project is a programme, which is in this case authors define as a group of related projects managed in a coordinated way to obtain benefits not available from managing the projects individually. A programme may also include elements of on-going, operational work. For the purposes of discussion in this paper, the following basic elements of the policy are instructive, especially for the assessment of food security programmes and their related community-based agricultural projects. Firstly, food security interventions will ensure that the target food insecure population gains access to productive resources. Secondly, where a segment of the target food insecure population is unable to gain access to productive resources then food security interventions will ensure that segment gains access to income and job opportunities to enhance its power to purchase food. Thirdly, the food-insecure should be made agents of their own development. Finally, the necessary interventions should be targeted to achieve clear, simple and realistic goals and performance targets with costs justified by delivering greater social benefits (IFSS, 2002: 6-7). When summed up, these elements make it clear that food security programmes among others are supposed to lead to employment creation, availability of food and justification of the investment made. Based on these underlying principles, the products, productivity, marketability and sustainability of such projects are key when assessing their potential to address income and poverty reduction concerns of the beneficiary communities (Pretty, Morison and Hine, 2003: 217). Indeed, in many development interventions, when food security programmes are tied to agricultural projects the marketability and sustainability of such projects become critical because such projects are almost invariably meant for income generation and poverty reduction (Webb, 1995: 174). In a broader sense, the marketability of such programmes may refer to the programme's ability to attract and sustain potential consumers of its outputs which is inherently dependent on the products (including value addition) and the productivity of such projects. Sustainability of such community-based projects is partly underlined by community participation which must be tied directly to the ability of projects to generate enough and regular income for the beneficiaries; especially the poor but not the elite in the community, if the projects are to be run successfully (Mansuri and Rao, 2004: 1). It is also important that in such community-based projects all segments of the community members, especially the youth, adequately participate in the projects from the planning stage, and have some basic knowledge and skills to run and sustain them (Frank, 2006: 351). In the current study it was envisaged that sustainability of these community-based projects would continue to be realised through continuation of the project beneficiaries in benefiting from the projects even after the various stakeholders have stopped supporting the project members through aspects such as assisting with coordination and financial support. The study focused on the Income generating projects (Community Projects) funded by the Limpopo government and located within the departments of Agriculture, Public Works, Health and Social Development. The projects were established by the provincial government with a view of alleviating poverty and they have been running since 2000. An indicative number of 108 project members in the province constituted the study sample. The study lasted between January 2010 and June 2011. The study used evaluative methods which are systematic application of social research procedures for assessing the conceptualisation, design, implementation, and utility of social intervention programmes (Jackson and Kassam, 1988: 1-3; Rossi, Lipsey and Freeman, 2004: 16). The respondents comprised of project members (beneficiary communities) and project administrators (supporting government departments). The project members were beneficiary communities from the income generating projects of the Districts in Limpopo province namely: Vhembe, Capricorn, Mopani, Waterberg and Sekhukhune. The greater part of the districts, the study area, have fertile arable land which is suitable for both large scale commercial and small holder crop and livestock production. The districts receive adequate rainfall in the summer. The annual rainfall range is from 290mm to 1050mm and the mean is 590mm (SARDC, 2002; Limpopo River Awareness Kit, 2011: 1-3), which makes agricultural activities very conducive during the main production season. Stratified random sampling was used in selecting respondents. Following from Strydom and Venter (2002), a number of strata that were mutually exclusive and members of homogeneous groups with regard to some characteristics, were sampled. The agricultural projects were grouped into the following strata: vegetable, poultry and piggery projects. A structured questionnaire was used to gather data. Trained research assistants from the University of Venda and the Department of Agriculture in Limpopo administered the questionnaires. The research themes included the issues on strategies used in the intervention, appropriateness of the target group/beneficiaries; effectiveness of intervention in terms of relative cost and accrued benefits; who actually benefited, etc. The data gathered were analysed using the Statistical Package for the Social Sciences (SPSS, 2010) package. Descriptive statistics and cross tabulations were computed. Inferences were also drawn from the qualitative data gathered. All five districts were represented in the study; Mopani, Sekhukhune, Vhembe, Waterberg and Capricorn. There was almost an equitable representation of the Municipalities in Mopani district while in Sekhukhune district Greater Marble Hall Municipality had 75% participants and Elias Motsoaledi had 25%. 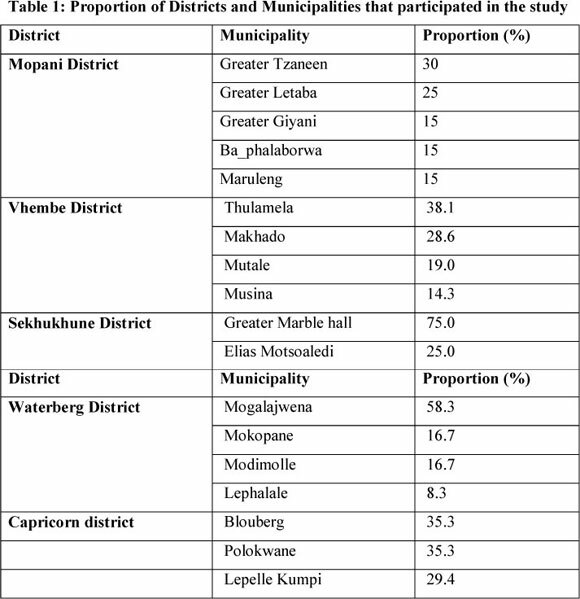 As depicted in Table 1, in other districts there was no trend in their representation of the respective Municipalities. Each project had a committee for management purposes of the project but few of the chairpersons (0.9%) were unavailable for interviews, the majority of respondents were deputy chairpersons (18.5%) and secretaries (42.6%) among other committee members. Most of the respondents (43.5%) have been in the projects for 11-15 years. The majority of the respondents were females (84.3%). As shown in Table 2, few of the project members were youth (9.3%) and few (4.6%) respondents had acquired tertiary education. The respondents indicated that a number of projects were established; and these include vegetable, piggery, broiler and layer production with a proportion of 46.2, 26.9, 25.0 and 1.9%, respectively (Table 3). The projects were established from 1982 to 2007 with most projects being established in 1998 (22.3%), and least (1.0%) in 1982 and 2004. There was no trend in the year of establishment of the projects. The majority (96.3%) of the projects were established in rural areas while few (3.7%) were established in urban areas of the Limpopo province. The type of settlement was Village (93.5%) vis-á-vis Township (6.5%). Most projects were established through community initiative (60.2%), followed by government initiative (26.7%) and individual initiative (12.0%), respectively. Majority (65.1%) of the projects were more than 2 km apart while 20.8% of the projects were less than 1 km apart. About 88% of the respondents reported that a project feasibility study was conducted prior to the establishment of the projects while 12% of the respondents indicated that the feasibility study was not conducted. The criteria for selection of project members were mainly through self-initiative (60.2%) followed by the government initiative (28.7%). About 69% of the respondents reported that transport was available within 500 m from the project facilities while 30.2% reported that it was unavailable. 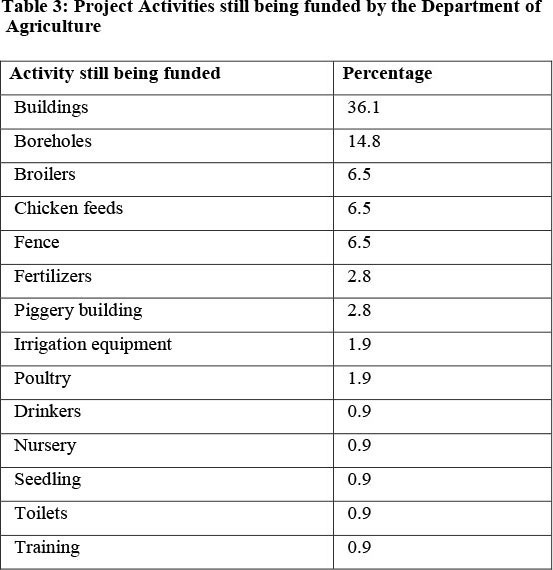 About 94% of the projects were funded by the Department of Agriculture while only 6% were not. The projects were funded beginning 1985 to 2010 with most projects being funded in 2004 (14.8%). At least 42.3% of the respondents indicated that funding is still continuing whilst 57.7% indicated that funding has been stopped. The Department is still funding a range of activities as shown in Table 3. Other funders apart from the Department of Agriculture included Dendron NTK, Department of Health and Social Development, Department of Social Development, Department of Trade and Industry, Eskom, Independent Development Trust (IDT) and Macbeth Company, with the Department of Health and Social Development funding most projects (61.1%). About 64.1% of the project members reported that access to input supplies needed for production was not a challenge while 35.9% reported that that was a huge challenge. The majority (78.7%) of the customers were community members and the least (0.9%) were business people, clinics and manufacturers (Table 4). The produce was mainly marketed verbally (44.4%; Table 5). Representation of all the five districts in Limpopo province is an indication that when security projects were established in the Province, all the five districts of the province were considered. This is crucial as it encourages every community member to be involved in the management and maintenance of the project. Community members need to be considered without partiality (Hall, Clark and Frost, 2010: 6-15) for them to be actively involved in the project activities, sharing experiences and expertise among themselves, and for everyone in the community to benefit. This enhances the sustainability of the project as indicated in the findings that most projects were established more than 5 years ago and were still running. This also shows the effectiveness of the bottom up approach advocated for nowadays in the fight for poverty and underdevelopment in rural areas (Altieri and Masera, 1993: 93; Rogerson, 2006: 37; Hall et al., 2010: 27-30). The finding that even within the districts, agricultural projects were initiated and developed in almost every Municipality and community is an indication that the establishment of the projects was done appropriately. This is supported by the findings that most projects were established in rural areas compared to urban sectors, as dimensions of poverty in South Africa show that people in rural areas are more poverty stricken compared to those in cities. Hence this goes a long way in enhancing food security, household income and addressing inequality in the country which could be achieved if the distributional shifts are pro-poor (Hoogeveen and Ozler, 2005: 1-5). The fact that the majority of the projects were 2 km apart was important in the sense that some Agricultural enterprises should not to be near one another for easy control of diseases but at the same time easily accessible and reachable for interaction purposes of the community members. Most of the projects were accessible showing that the feasibility studies that were conducted gave useful insights into the establishment of the projects. In addition, accessibility of projects was crucial for the quick and ease of marketing of products. If well managed and maintained food security will be achieved for households involved in the projects. This is supported by literature where every member is considered important for the flourishing of a community-based project (Ansell, 2005: 72; Leavy and Smith, 2010: 1-15; Stuart, 2010: 53). Lasker and Weiss (2003: 14-15) argued that every individual is crucial for development in rural areas; children, youth, men, women and community leaders. Despite the fact that each group should be represented in community development initiatives, youth are still not properly represented as found in the current study. This is concurrent with Matthews, Limb and Taylor (1999: 135) who postulated that youth are marginalized although they may be given opportunities to engage in discussions about their economic, social and environmental futures, they are seldom given chances to express their preferences outside of adult-dominated institutions, leaving participation as an adult activity. In addition, Stilwell (2011: 50) reported that social exclusion is still evident in South Africa as participation is mainly by adult men and less by women; an indication that youth participation in rural development initiative is negligible. It could be that youth favour large cities and consider Agriculture based initiatives as backward. More is yet to be done to encourage youth to participate in rural community development initiatives and not undermine the type of initiatives. Checkoway and Richards-Schuster (2003: 1) and Walker (2010) argued that young participate in community evaluation research, but their participation is uneven. The authors further elaborated that some young participate with fervour, and others express interest but are unsure how to proceed, and still others try to proceed but lack support from adults or face obstacles in the community. This makes youth participation undefined, underdeveloped and hence requires further exploration in order to educate and encourage youth to participate in community development programmes. It is paramount that the project members form a committee to administratively run the project activities. Invaluable information gathered from available committee members is important for the review of the projects and for future plans that lead to sustainable development. Although some committee members could not be reached for interviews, others were available making it easier to gather the required information in the stipulated time periods; hence committees should have several representatives. The finding that vegetable and piggery production were among the most projects ventured into is an indication that they could be easy to manage. This is supported by the fact that most project members had not acquired tertiary level of education thus management aspects of such projects were easy to grasp. The fact that mostly women were involved in such projects is in line with the report that women are found manning the households in most rural areas while men are in cities seeking employment (Holmes and Jones, 2010: 2; Kevane, 2010: 1; Quisumbing and Pandolfelli, 2010: 581). Kumase, Bisselenua and Klasen (2008: 9) also reported that women farmers in Cameroon have access to land (of similar size to men), but what is worrying is that they have little control over the marketing and proceeds of agricultural products and have limited access to extension services. This adversely affects the sustainability of food security programmes. Despite the efforts of addressing gender and inequality so that men and women both play a substantial economic role in African economies education and employment still directly and indirectly limits economic growth in Africa (Klasen and Lamanna, 2008: 5; Kumase et al., 2008: 11-12). In addition, most rural households are affected by the HIV/AIDS pandemic leaving households being female-headed and child-headed (Mutenje, Mapiye, Mavunganidze, Mwale, Muringai, Katsinde and Gavumende, 2008: 75). This call for food security projects to consider the training of women and children on skills that empower them for improved agricultural activities and hence improve rural household, food security and incomes. Funding of the project by the various funders as depicted in the findings of the current study is critical for the sustainability of the projects. It is imperative that reviews conducted for the projects are shared among the various stakeholders so that views and opinions come from various individuals and responsibilities are equitably and appropriately shared among the stakeholders for the improvement and subsequently sustainability of the projects (Musemwa, Mushunje, Chimonyo, Fraser, Mapiye and Muchenje, 2008: 239). The fact that access to inputs required was not a significant challenge could be attributed to the availability of various funders of the projects. The fact that most customers were community members shows that the project benefitted its community despite the fact that one may or may not be involved in the project. Individual initiatives were most often one of the criterions for involvement in a project. This could imply that the communities were food secure to some extent. On the other hand, this could be a measure that still needs to be looked into as this may have led to generation of insignificant income for the project members. Several studies show that rural communities have challenges in the marketing of their produce (Jari and Fraser, 2009: 1129; Musemwa etal., 2008: 241; Street, Stirk and van Staden, 2008: 706-707). This is in agreement with literature for the Department of Agriculture, Limpopo province where it was found that rural communities have challenges in marketing their produce. They do not have reliable or contracted market for their products, in some instances markets are unavailable and their products fail to meet market requirements. Markets need products in bulk which the community project members may not be able to meet, some consumers need for example already dressed chickens, of which project members may not have the capacity or knowhow to deliver. On the other hand, due to these limitations community members may be perceived incapable of producing healthy food to the consumers' satisfaction which is one of the mandates of the Food Control System in South Africa (Chanda, Fincham and Venter, 2010: 816). Chanda et al. (2010: 817) reiterated that safety of food for consumption regarding handling, storage, processing and distribution is crucial. It is, therefore, imperative to develop demand-driven skills for training the rural communities involved in agricultural project initiatives. Little/no knowledge may cause the members to run at a loss as chickens which are supposed to be sold at six weeks of age may end up being sold at 12 weeks of age. Agricultural practical training would be critical for the members. In some of the Districts in Limpopo province a production structure plan is implemented, for both egg and broilers production but might not be ideal due to the advent of diseases and hence high mortality rate of chicks and broilers. A well planned structure for any business determines its marketability and sustainability and this still needs to be addressed in the Limpopo province. There is a need to do market surveys before the establishment of the projects (Miller, Besser, and Weber, 2010: 253; Ogunleye, Thomas and Oyebade, 2010: 106-109; Park, Mishra and Wozniak, 2011: 12). In addition, studies need to be conducted on the marketing strategies for a given initiative so as to improve on the marketability of the agricultural products and subsequently their sustainability. Factors to be considered should include having contracts with the nearest retailers and shops, strategies for meeting market demands in terms of quality and quantity, and widening of the advertisement methods and bands. The sustainability of the projects was moderate as most of them have been established for more than 5 years and were still running. This was enhanced by the feasibility studies initially conducted that gave useful insights into the establishment of the projects and possibly funding of the projects by various funders. Of the established projects the vegetable and piggery production projects were the most viable. It is mainly women who were involved in the projects, youth and men were limited. Most customers were community members indicating that communities benefitted from the projects regarding income generation and food security. However, challenges exist especially in the Limpopo province regarding marketing of agricultural produce and value addition to the produce. Reviews of the established projects should be done often and the reports shared among the various stakeholders. This is paramount for capturing views coming from various individuals and, equitable and appropriate sharing of responsibilities among stakeholders. This consequently leads to the adjustment, improvement and subsequently sustainability of the projects. It is critical for policy makers to reckon reliability and contracted markets for the products of the established food security programmes. In addition, training of community members should be mandatory on Agricultural technical and production practical training, market surveys and marketing strategies. The marketing strategies should include advertisements, meeting market needs and demands such as quality, value addition of the products and safer, healthy foods to the consumers' satisfaction, and broadening and/or creation of markets which could be unavailable. Aspects on well planned structures for any business would be crucial for the marketability and sustainability of the Agricultural and/or food security projects. Policies should also consider ways of including attractive incentives, education and promotions in order to encourage youth and men to participate in community projects. The provision of equitable distribution of responsibilities, training on Agriculture and marketing of produce, access to inputs and any other related matters should be provided to everyone without disparity as a way of addressing gender and inequality. This necessitates both men and women playing a substantial economic role in African economies. The authors are grateful to the United Nations and from the Presidency for funding the project. Sincere gratitude goes to the Department of Agriculture in Limpopo Province, the Community Engagement Directorate and, the Institute for Rural Development at the University of Venda for the technical support rendered. Fax: +27 15 962 8859.